Christmas fat burn - A unique dance workout!! 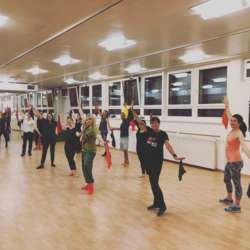 You must be a member of the Zurich Dancing Group to attend this activity. Would you like to join this group? Here’s exclusive free dance workout based on Indian folk dances, hip-hop, latino and Bollywood with which you can burn upto Protected content with lot of smile on your face. Join to Sweat with Smile!! RSVP and please avoid noshow as room cost to the organizer.